There’s a great atmosphere around the college this week as it’s the last week of teaching term for the first semester. As one who strongly opposed the introduction of short semesters, I have to admit there’s a great sense of closure as staff and students reach the end of taught courses. This morning I finished the course with 1st science and went through last year’s paper with 1st engineering. This afternoon it’s the turn of 3rd year solid-state physics – a lot more serious as we revise all the major concepts the hapless students will need to know for their exam. Meanwhile, I’m preparing yet another public lecture (slides here) on the LHC, this time as the keynote address for our careers day in physics at the college tomorow . What careers? 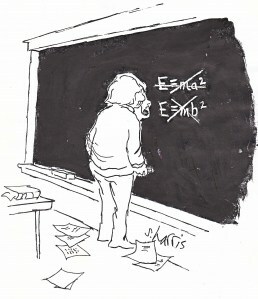 Well, mathematicians and theoreticians have been kept busy calculating collision events and decay schemes. Engineers and experimentalists designed the detectors and experiments. Civil engineers build the major construction projects. Last but not least, computer scientists and software engineers have been working hard on constucting new methods for dealing with the petrabytes of data – not least the latest in distributed computing – the GRID. There’s a great article on this, the Large Hadron Computer, in the November issue of Physics World. The GRID – National nodes at tier 2, universities at tier 3. It’s often forgotten that the world wide web was orignally developed at CERN in order to facilitate the analysis of data from particle experiments at CERN . It’ll be interesting to see if the GRID has similar application to the world at large. P.S. No teaching next week, and I can finally get down to some writing. After, that I’m going skiing yipee. Comments Off on Last week of term!